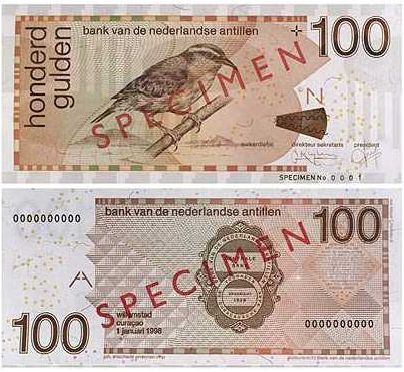 WILLEMSTAD/PHILIPSBURG — The Central Bank of Curaçao and St. Maarten (CBCS) recently announced in a public statement that it had been informed that counterfeit 100 guilder banknotes are currently in circulation in Curaçao. Almost all of the banknotes examined had the same serial number, i.e. 8257613310, while genuine banknotes all have a unique serial number. When accepting more than one banknote, it is advisable to make sure all the notes have a different serial number. The counterfeit banknotes were worn – the text on the notes was faint or even partly missing. The print on genuine banknotes (including the legal text) should always be clearly legible. If you are offered a banknote where this is not case, you are advised not to accept that banknote. While the dominant color of a genuine NAf. 100 banknote is brown, the counterfeit notes had a more pink and greenish color. The front side is imprinted with a pearly ink that gives an iridescent effect. Under angled light a shiny gold-colored pattern becomes visible. When accepting banknotes, always pay attention to the color of the notes. 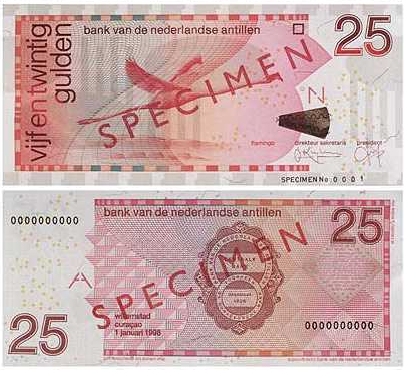 Do not accept banknotes with a color that differs from the usual color or resembles the color of another denomination. On the counterfeit banknotes, the curved line of the pattern that is printed over the gold-foil seal does not connect to the line printed on the ‘white’ part. This leads to the conclusion that the gold-foil seal was applied to the banknotes afterwards. There have also been detected fake banknotes where the gold-foil is missing, notes where the gold-foil doesn’t shine and notes where the gold-foil appears to be pencil-drawn. The letters N and A on a genuine banknote are perfectly aligned when holding the banknote up to the light. Some, but not all, of the counterfeit banknotes did have the letters aligned. The paper used for the counterfeit banknotes has a different feel than the genuine banknotes’ paper. 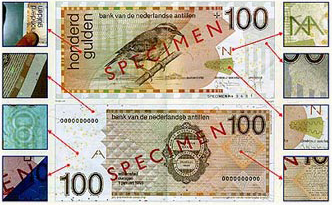 For some of the counterfeit banknotes, lower banknote denominations were bleached and reprinted with a higher denomination, which implies that the banknotes concerned do have the authentic security features such as the watermark, the pearl-like dots (planchettes) on the back of the banknote and the gold-foil. You are reminded that it is illegal for any person and or institution to accept counterfeit banknotes. You are advised to immediately contact the police if you think you’re dealing with a counterfeit banknote. The counterfeiting of banknotes and the fraudulent use of counterfeit means of payment are punishable by imprisonment of up to 9 years. For more information about the security features of banknotes please visit our website http://www.centralbank.cw/banknotes.